A decade or so back, people would have shivered by the thought of going through a root canal treatment. Rather, they would prefer having the tooth extracted and removed, while not waiting to be under the pain of having this process. In the present day scenario, root canal treatment is one of the commonest processes undertaken for salvaging an infected or heavily decayed tooth. We have some of the recent advanced in root canal treatment in our dental clinics in India, which offer the best services of this particular procedure. Root canal is the canal present inside the root of a tooth, which is buried inside the jaw bone and is the passage way for nerves and blood vessels. Below the enamel of the tooth, the root holds the entire structure in place. Due to infections and decay, the root gets necrosed and starts off with severe pain from time to time. On detection of such an infection in the roots, people need to get the root canal treatment, which is basically a surgical procedure, required to be done in the dental clinics, under the guidance of a dentist. In the past, such treatments were highly painful, due to which many people didn’t want to go through the process and instead chose to get the entire tooth extracted. Nowadays, advanced methods of anaesthesia and fine instruments have helped in conducting this process quite easily and quickly and that too, without any pain in root canal clinic in Delhi. Below the tooth is the pulp of the dental structure, which is quite soft and extends from the crown above the jaw bone to deep inside the bone. It comprises of nerve and blood vessels and soft tissue. When bacteria get inside the pulp, they can stay there for long time and repeatedly cause infections. Bacteria, along with decaying materials can cause pus and pain repeatedly. Over a period of time, there is abscess and necrosis of the tissue, which leads to intolerable pain. Sometimes, the inflammation extends hugely to include the swelling on the face and neck and pain radiates to a long way down to the shoulder or up to the head. 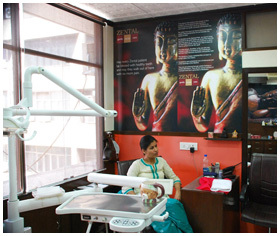 In our dental clinics in Delhi, root canal therapy is provided by a general dentist or endodontist. Usually, it requires more than one visit to carry out the complete root canal treatment in Delhi. Initially, with an x-ray, the extent of the pus is assessed and then the anaesthesia is given. In our dental root canal clinic, this process is done with extreme care and good quality anaesthesia, where the dentist works on the dental chair, with all the sterilised equipments on board. The process starts with a hole being made through the crown, which then allows the fine instrument to enter into the canal and then into the pulp chamber. With fine instruments and suction machines, the pulp tissue is removed. After this, the pulp cavities and chambers are flushed and bacteria and pus removed. The canal is widened and reshaped, so that the infection is removed in whole, not allowing any amount of infected tissue to remain back. After the cleaning process is complete, dentist in our clinics for root canal treatment in Delhi, work on refilling these canals. Best quality fillers are used, so that these stay in the roots for years together and are not prone to further infection. Sometimes, it is also possible to put in medications inside the pulp, so that any remaining infection is cleared. In case multiple visits are required, temporary filling is put into the canal, till the infection is completely controlled and the canal is ready to be filled up permanently. Depending on the infection and the extent of spread, the root canal treatment will take two to three visits. The canal is filled up with sealer paste and rubber material and then an adhesive filling is put over this to ensure that saliva is no more in contact with the filled canal. In the final stage of the root canal therapy, dentist in Delhi makes a crown and restores the tooth like the original. Crown is made of gold, porcelain or metal and tinted to match the colour of your tooth. After the crown is fitted on the post, a new tooth is in place, which looks almost like the original tooth. Now that the new crown is complete, it looks aesthetically pleasing and the infection is removed. Since, root canal treatment in Delhi is a very specific form of treatment, the costs can be usually told to the patients. In our clinics, you can get an estimate of the total expenses after the dentist in India makes an assessment using the x-ray and initial clinical examination. We offer the best services for reasonable rates, because for us, the satisfaction of the patient is the reward. For a few thousand rupees, dentist in root canal clinic in Delhi can carry out the root canal therapy and it can be of great help for salvaging a tooth and keeping it again for a lifetime. There are plenty of procedures in our dental clinic in India, where expertise of dentists is required. Root canal treatment in Delhi has nowadays become the simplest of these procedures. It can be done in any sitting, without much planning and hence, it is a common procedure in dental clinic in Delhi and possibly done by a general dentist, who has had a bit of experience in the field.